Melt Shop | Quad Infotech Inc.
Users are fully engaged in intuitive and easy-to-use features with graphic rich designs in a number of operational screens. From the preparation of raw materials in a blast furnace or scrap loading, to the melting and refining of hot metal and steel, to the final casting of billets or blooms, QMOS has all the advanced capabilities to capture, display and offer analytical tools for any melt shop user. Whether it’s an unexpected EAF Power Off or a closed caster strand, QMOS tracks upset conditions down-to-the-second and assigns appropriate responsibility to each delay. Whether a delay is attributed to operations, maintenance or it is scheduled, operators have a multi-hierarchical and fully customized structure they can select from to fill in the details. Detailed analysis on utilization %, breakdown by area or crew are just a few of the KPIs available amongst the many reports and screens dedicated to delay tracking. Whether the Melt Shop has a conventional bucket charging or a Consteel process, QMOS provides comprehensive scrap recipe management tools to help the scrap operations operate more efficiently and effectively. Detailed scrap recipes maintaining scrap type, quantity, layering, pile location and charge number requirement information can be defined in QMOS. Interfaces with the scrap yard scales facilitates accurate recording of scrap consumption ensuring yield targets are observed. Specific piles where scrap was consumed from can be recorded to help in raw materials procurement and inventory control. QMOS can link with the plant’s home grown scrap optimization knowledge base in order to incorporate the optimization models into its calculations. QMOS also interfaces with third party optimization tools to provide proven and reliable optimization models. The Alloy Calculator in QMOS provides the operators with a user friendly tool to accurately calculate the alloy requirements. The 2-way algorithm can predict consumption requirements based on desired chemistry inputs or calculate the expected chemistry based on consumption inputs. Metallic and nonmetallic alloys, fluxes, recycled scraps and iron ore as well as refractory consumables added to heats and melt shop equipment such as Ladle and Tundish can be recorded automatically or manually in QMOS. This wealth of information is used in process and cost analysis tools and reports. QMOS has comprehensive tools capable of tracking any parameter for any equipment. The fully customizable functions allow process engineers and operators to record and display the number of heats, liquid steel contact time and tons, preheater temperature and gas readings. Points of tracking can be modified to optimize the data and enrich the analysis tools available. 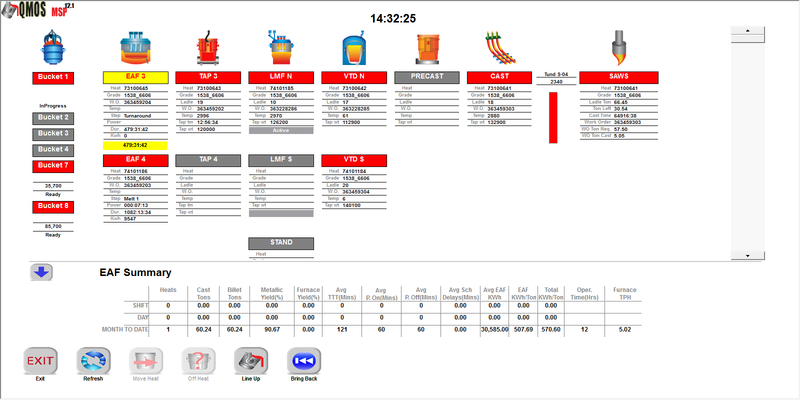 MSP module has full capabilities to interface with any Level 1 PLC managing the shop floor process data. Data is instantaneously recorded, and displayed in real time across the QMOS operational screens. Should specific data be needed to be sent back to Level 1, QUADs PLC Feeder program can handle that. Such automation capabilities eliminates the need for operator involvement, therefore allowing them to focus on making steel. The standard operating procedures in the melt shop ensures process standardization across all processes and crews. QMOS provides a rich inventory of the industry’s best practices which can be combined with each plants home grown and proven methodologies. QMOS’s quality control functions can receive data from the lab as they are measured. The sample results are sent from spectrometers or slag analyzers to QMOS via interfaces, and evaluated against the chemistry specs of the heat in real-time. The results are displayed to the operators immediately, assisting them in making crucial decisions with plenty of time to react. If the sample results are outside the specs, heats and their billets will go on Hold. Operators may choose to divert the heat, reapply to another order, perform a pour-back, override and more. QMOS provide a wealth of out of the box, best-in-class KPIs. At the same time any home grown KPIs can also be added to the list. QMOS provides the users with comprehensive analytical tools and information for process improvement initiatives. Detailed shift reports provide a comprehensive look into all activities of the shift such as production, consumption, delays, performance, crew details, note and much more. Shift reports from any date can be accessed instantly with a few clicks.